The September 2017 quarterly report spelled out a renewed bullish message from the International Fund team: the oil price is headed higher. The Australian Fund has not had as many oil exposed stocks to choose from, but we have recently added to the Fund’s oil exposure. It’s an asset heavy business in a difficult environment with an uncertain future. In many ways, a classic Forager investment. MMA Offshore (MRM) owns vessels that it leases to the offshore oil and gas industry. These vessels mostly tow anchors and ferry supplies to drill rigs. 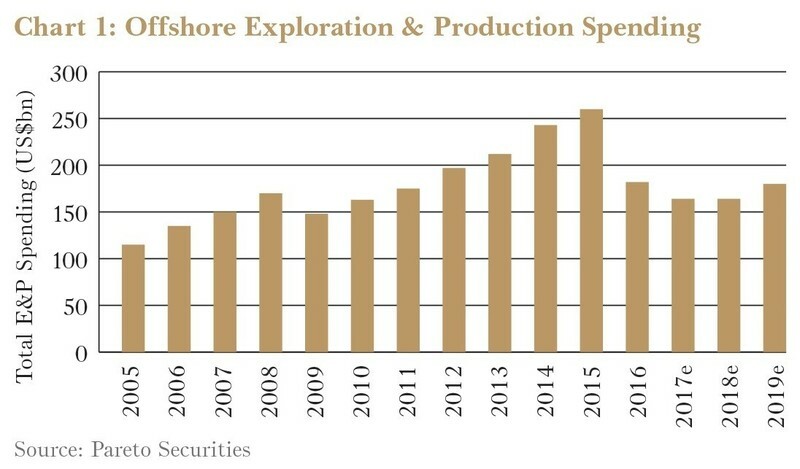 The 2014 oil collapse pushed explorers and producers to reduce their spending on offshore fields. This left MMA, and competitors, without much work to do. To make life more difficult, the last few years also saw plenty of new vessels, ordered when the oil price was above $100 per barrel, finally ship out of the yards. MMA ordered vessels too, and spent $450m acquiring a Singaporean competitor. Day rates to contract these vessels have now halved. This is barely enough to meet the costs of crew, leaving little to refresh vessels, pay interest on debt, or reward shareholders for their investment. Many older vessels are still sitting on the sidelines, running a skeleton crew until they are called upon to work again. The destruction of value in the industry has been severe. Many firms sunk under heavy debt loads. And MMA nearly joined them. To stay afloat it had to sell its prized supply bases and some of the older vessels. The business lost $380m in the 2017 financial year as it wrote down the value of its remaining fleet. At 30 June that year it had net debt of $295m and a market capitalisation of just $60m, a far cry from $800m in 2014. The Fund has owned MMA before, purchasing shares in early 2015 when the company was trading at one-third of book value. 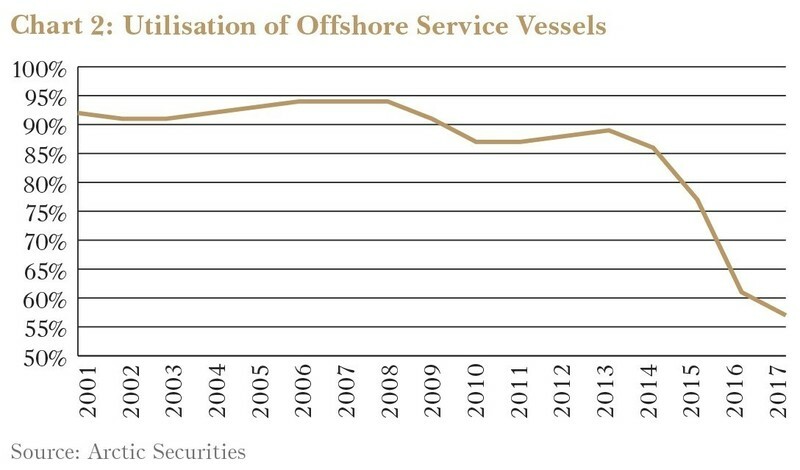 The value of the vessels fell faster than anticipated, and the tightening debt situation meant that either offshore activity had to improve quickly, or MMA needed fresh equity. We decided to sell the Fund’s shares in mid-2016 at a loss (wisely, in hindsight). A longer runway for one. MMA did raise that equity. Existing and new investors, including Forager, contributed $97m of new equity at $0.20 per share. The proceeds will be used to reduce debt. In tandem, MMA’s banks extended the maturity of the debt to September 2021. The raising was priced at about half the current book value and five times expected future earnings. We are also a few years closer to MMA’s vessels getting back to work at reasonable rates. For 15 years prior to the oil collapse offshore support vessels were in use 90% of the time, against only 57% now. No vessels have been ordered in the last few years, and many of the currently waylaid vessels are too old to return to work. Meanwhile, offshore spending needs to rise to maintain oil supply. MMA’s core fleet of new, high spec vessels is in a good position to benefit. It’s unlikely to be smooth sailing, though. While there are some early signs that activity is returning, it might be years before we see more normal earnings. MMA, with Forager on board, now has time to wait for a recovery. This blog post is an extract from the Forager December 2017 Quarterly Report. If you are interested in receiving the Forager monthly and quarterly reports, please register here.